Thanks for another fun Mardi Paws! We teamed up with the Community Wellness Alliance Collaborative, the North Columbia Heights Civic Association, Encounter Church, and Viva the Life to host the 2019 Mardi Paws. The March 9th event included a dog costume contest, prizes, and giveaways. We also collected donations for the Humane Rescue Alliance. On December 9th, Santa dropped by District Dogs to meet the good dogs of 11th and Bark. In addition to getting to tell Santa what they wanted for Christmas, the dogs also got a photo with St Nick. Thanks for everyone who volunteered, brought their dogs, and donated to the park. Check out some of our favorite photos. On December 8, 11th and Bark sponsors another park cleanup. We picked up poop, raked and bagged leaves, cleaned the benches and tables, removed some metal that had been exposed from erosion. Thanks to everyone who helped! We are excited to team up with the Petworth Arts Collaborative for the 2nd annual celebration of Dia de los Muertos (Day of the Dead). The day celebrates the lives of loved ones—family, friends and pets—no longer with us. It is a great way to share a common experience, not just with friends and neighbors from the dog park, but with those from across the community. Learn more about el Dia de los Muertos here. We will make marigolds, butterflies, and paper garlands that we will use to decorate the dog park on the Day of the Dead. We will also have supplies for the ofrendas (shadow boxes) we will make on October 27th. What: Help us create marigolds, sugar skull garlands and other decorations from tissue paper. What to bring: Yourself. We will supply tissue paper, scissors, and instructions (if you need them). Please RSVP here for this event. Make your own shadowbox celebrating the life of a loved one, family friend, or pet. Take your ofrendas home and showcase them around the neighborhood on November 2nd. What to bring: Memories, souvenirs, and photos of and about your loved one. We will provide crafting supplies, boxes (big and small), tissue paper, and other materials. You can RSVP here for this event. There will be a procession up Georgia Avenue and celebrations at both the dog park & Columbia Heights Green. Dress up your dog or just enjoy the fun. Thanks to everyone who came out on Saturday to help make the dog park and the community just a little bit better. We mulched the tree boxes, edged and pulled the weeds inside and outside of the park, disinfected the benches, and cleanup up dog poop. We also added new new poop bag dispenser. Just an hour of work made a huge difference. And after the cleanup, a few of us joined together for a dog friendly brunch at Bar Roubaix. To volunteer at the table or the dog show, email us. On Saturday, April 21, 11th and Bark held a cleanup at the park in conjunction with a neighborhood-wide cleanup, the Great CoHi Cleanup. In addition to picking up any debris in and around the park—including up and down Park Rd. and 11th St.—volunteers repainted the benches and table, and repaired the plastic meshing that keeps small dogs safely in the park. The biggest project of the day was creating a dry well to stop a standing water issue not-so-fondly referred to as "the pond." Thanks to everyone who spent their afternoon helping, and in particular those who were on shovel duty. Thanks to Ward 1 Councilmember, Brianne Nadeau, for fighting to try to get money in the budget so that the DC Council can buy, save, and improve the park. And, a thanks for stopping by the cleanup. See how much fun it is to clean up the park! Thanks Jamie and Penelope for all your hard work! On Thursday, April 12, seven park supporters spent their afternoon asking the DC Council to add funding to the FY2019 budget to purchase the Columbia Heights dog park from WMATA. As you might already know, WMATA owns the property at 11th and Park, but has let us use the land for a dog park since 2009. Now, WMATA wants to sell the land. Our only chance at saving the park is for the District to buy the land and make it an official city park. 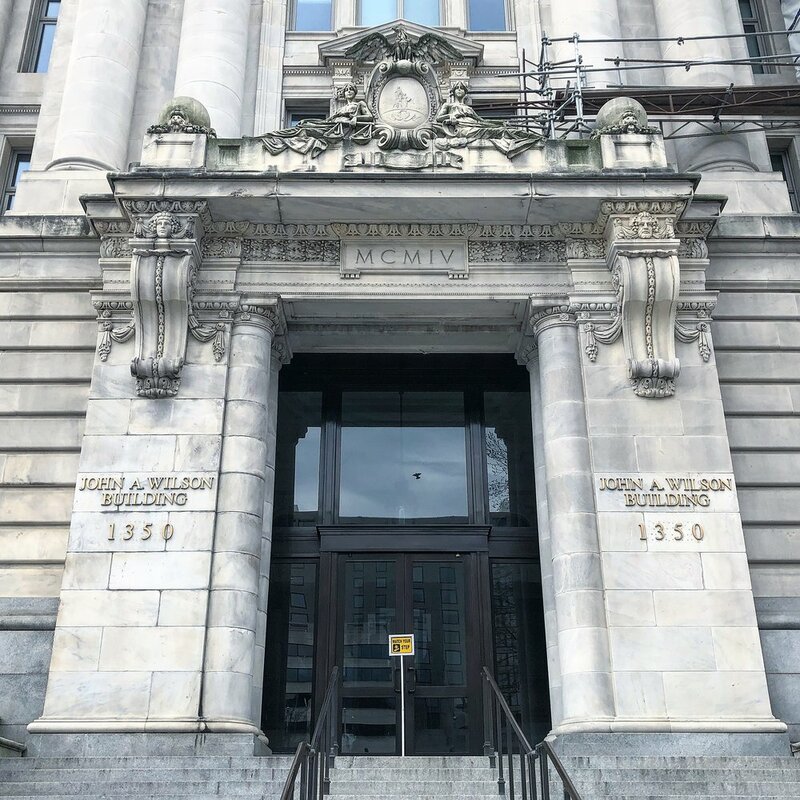 On Thursday, the DC Council Committee on Transportation and the Environment held a hearing on the parks and recreation budget. Five people testified before Chairwoman Mary Cheh (Ward 3) in support of the park. Lori Robertson, Chair of 11th and Bark, spoke about the nonprofit that has been trying to work with WMATA to improve the park for several years. Eva Guenther explained to the committee that the park is about more than just the dogs, it is also about the relationships and community is fosters. John Henderson, of Green Spaces for DC, testified about the importance of green space and that the Columbia Heights neighborhood is already lacking in parks. Yared Mekbib, spoke to his many years as a park-goer and what the park means the neighborhood. And, Penelope Poole, spoke to her experiences in the park and how she and her husband, who is blind, chose their home so that Aaron's service dog could use the dog park. Park supporters also presented the Council with the petition, signed by more than 1,400 DC residents; statements in support of the park from 216 DC residents; and letters from 11th Street businesses and neighborhood nonprofits. Councilwoman Cheh expressed concern that we could lose our well-established, strongly-supported, and well-loved park. She noted that once you lose green space you never get it back and that the District can't allow every square inch of land to be turned into buildings. She also expressed interest in trying to work with Councilmember Jack Evans (Ward 2), who is also the Chair of the WMATA Board, to try to find the funds to purchase the land. Convincing Councilmember Cheh to take an interest in our park is a huge step forward that we could not have done without park-goers signing the petition and engaging in social media advocacy. But we haven't won yet. We need to do more. park-goers to call and email members of the Committee. a good showing at the April 21 park cleanup to show that we will take care of an official park if the District buys it. you to come to our next happy hour, Wednesday, April 18 at 6:30 at Wonderland to help take action and thank those who testified on your behalf on Wednesday.